The purpose of this program is to assist city maintenance crews in litter control along the bike trails. 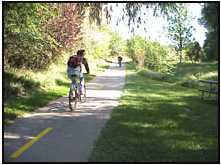 An organization or group of individuals can adopt a section of trail for a period of one year. Volunteers are recognized by a sign, with their organization name, at each end of their section. Adopters are responsible for litter control along their section of trail (usually .5 to 1 mile long) at least once a week as weather permits, or as often as possible. We feel that “every little bit helps” in this case! The Adopting organization commits to a one-year period of adoption. At the end of that an organization can renew, change sections or terminate. Monitoring of your section should be done at least once a week during the warm season, and as weather permits in the cold season. The City of Fort Collins will provide the trash bags and will be responsible for collecting and disposing of the filled bags. The City of Fort Collins will place a sign at the end of your section crediting your organization for litter control. An adopting organization may keep any and all proceeds from any material with recyclable value that is found.